Naturally fermented. 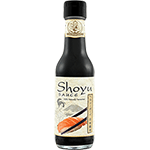 Shoyu sauce is used as dipping fir sushi, sashimi with wasabi to experience the authentic Japanese cuisine. Product of Thailand.